I'm not even going to lie, nor shall I pretend to be humble. The fact of the matter is that I'm good at making soft jumbo pretzels. There, I confessed it. It's not that I'm better than you or that I'm conceited in anyway, I'm just stating the facts. And, since it is National Pretzel day - yes, this day exists, there is no better day to talk pretzels. I used to make them every Sunday for my family. And, sometimes quite often during the week too and then I'd walk them to my husband's work and share the deliciousness with his co-workers. He loved it. They loved it. And I loved sharing, it was a win-win for all involved. Then we moved and he started working from home and while I still like making them, taking them down stairs to his work, where he's the only employee, well, it's just not the same so I don't make them nearly as much as I used to. So, do you want to make your own? I should totally do a tutorial with photos on this one but I don't have any photos so I will just leave you with the recipe and instructions and we'll call it good. Plus, I know there are a gazillion posts out there that can probably walk you through the steps visually should you need it. Step 1 - Combine yeast, sugar and water and let rest for 5 minutes or until yeast is frothy. Step 2 - Add flour and mix well. Knead until well blended, usually for me this is about 5 minutes. Then Place dough in greased bowl, cover and let rise 1 hour. Step 3 - Once dough has risen, mix in shallow dish the water and baking soda, stir to combine. Step 4 - Set water mixture aside and break off a baseball sized pieces of dough and roll out with hands into a long rope. Then form into desired shape. Step 5 - Dip shaped dough into soda and water mixture, be sure to dip both sides and place on a greased cookie sheet. Repeat until all the dough has been used. Step 7 - Let rest for a couple of minutes and then brush with melted butter and add topping. Kosher course salt or cinnamon-sugar are two of my family favorites. Step 8 - my favorite step of all - EAT THEM! Yum! - Depending on the size you make them, you can normally get 7 to 9 large pretzels from a batch. Doubling the batch works ok but don't triple it. For some reason every time I've tried to triple it, they always fail. - If your oven doesn't go up at to 450 degrees just cook them at the highest setting possible but cook for a little longer than recipe says. 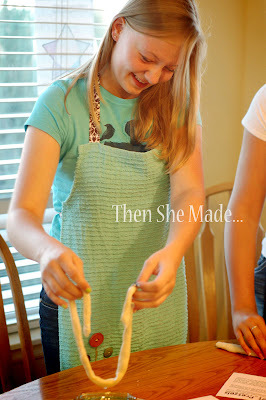 Finally, an easy pretzel recipe!! Made these last night - they were easy and so yummy!! My family scarfed them down! I'm going to try taking them out of the oven a couple minutes early and freeze them. We can pop them in the toaster oven for a quick snack.